Emphatic and defiant play by the Blackness who right from the get-go with Kapa O Pango, looked to unleash a weeks worth of frustration and mongrel on the Wallabies. Didn't start well with a dropped ball on the opening kickoff to Ali - but his next mistake was at the 40 minute mark, and in between we saw the type of performance that defines teams. The second half was no different - with pace and passion, and a lucky try to close out the game. After last week, this team was in need of that, a performance that was structured, where tackles were made, the defensive line swept forward together, the forwards hunted as a unit and rucks were hit with venom. It was mistake free, back to basics rugby. Dare it be said, it was smart rugby - led by the head - and finished with brawn and controlled fire. With McAwe back in the saddle, the loosies were outstanding - Kaino and Rodders both settling into their roles and totally outplaying their opposite numbers. Rodney's one chip and chase was quickly seen as a lost cause - and he settled down to doing what loosies are meant to do. Which is to say, tackling until they're dead and stopping the blokes in yellow from getting anywhere near the advantage line. The tight forwards were all over it - and with Mark Lawrence preventing Baxter and co from dominating the scrum with their inability to scrum - they prospered and as CGW would say "SMASHED 'EM BRO!". Woodcock's two tries were excellent reward - but Brad was solid and cunning, while Ali just seemed to be everywhere. The backline wasn't called upon to explode, but they were excellent as a unit - chased down everything and the kicking from hand was far sweeter and smarter than what was utilised last week. Sivi went looking for work and although I just wanted him to explode with the pace - was safe - and amazingly for a Fijian - didn't do anything to lazy. I seem to recall him even blowing one of the Wallabie loosies off a ruck early in the first half. DC - top drawer kicking - even with the slip, managed to control it. Looked for gaps and took them - tackled like a machine. Nonu - the try in the final seconds was a burner - I thought the touchie was going to bust a lung trying to keep up - his swing to the inside made Lote pause for that split second - and he got the rub of the green from the TMO. Top stuff. The lineout. Superb. Hansen and all of the boys involved there - take a bow. Stole Aussie ball - contested pretty much every single throw. Clever set moves - mixed with the simple throws. Even Cowan got in on the act - hassling on the Aussie throws and getting right into the lineout to take part. Again - superb. Lawrence - top game. Well controlled - despite the best efforts of his touchie to get in the way. Allowed game to flow - was sharp to the players when it was needed - but also explained his calls. Smith was lucky he didn't bother with the replay - but I was happy he stayed on - Lawrence made a fair call - and it didn't give any grounds for the game to fall apart. Substitutions: AB ones - IMO a little pointless - Boric at the 78 min mark? Weepu didn't really have time to boss the game - while Prince Tui Teka collected another clean jersey for his efforts. To be fair to most of them, the game was a done deal by then. The Cartel: It was a complete team performance - by the 15 on the field - and the extended squad - and the ones in management. It's always interesting to see who gets the brickbats when the team loses. And who gets the bouquets when the team wins. Everyone in the AB setup will have felt the pain after last week - irrespective of what any journalist or armchair critic would say. They took all that and responded in the single best way possible. Hats off. The Wallabies. No need to panic and go all Chris Rattue. This was the same side that dealt to the AB last week. But they were outplayed. Plain and simple - by a team that wanted it more. Much like last week, where the team that wanted it more were coached by Robbie Deans. They have class - the ease with which they scored their try tells you that. The "pass-kick" tactic so early in the game struck me as grasping. Mortlock was solid in that backline - but he didn't bring as much back to the Wallabies as Richie did to the All Blacks. I'm not sure if the ABs should be a little nervous about that. For the AB fan - the simple fact that the Wallabies don't travel well - bodes well for the Bledisloe, if not the Tri-Nations. This was a superb game to watch and enjoy - had me pacing the lounge with nerves, no matter how hard I tried to be relaxed. As Ritchie said - a game that sets the standard. One that they'll continue to aim for. This is a new squad - it's not the 2005 vintage, nor does it have the experience and the big names of 2007 - but on that performance, particularly backing up after the thumping last week - there's plenty to look forward too. 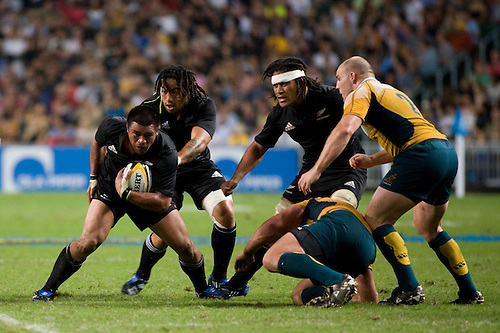 Big ups to the All Blacks - for a performance worthy of the great game - and the name sewn on your jersey.